Speratus, Paulus, D.D., was born in Swabia, Dec. 13, 1484. In a poem, written circa 1516, on Dr. J. Eck, he calls himself Elephangius, i.e. of Ellwangen; and in his correspondence, preserved at Königsberg, he often styles himself "a Rutilis" or "von Rötlen." These facts would seem to indicate that he was born at the castle of Röthlen, near Ellwangen. This property belonged to the Probst of the ecclesiastical corporation at Ellwangen, and Speratus's father was probably their bailiff or agent. The family name seems to have been Hoffer or Offer, and to have been in later years, following a practice common in the 16th cent., Latinized by himself into Speratus. He is probably the "Paul Offer de Ellwangen," who matri¬culated at the University of Freiburg (Baden) in l503. He is also said to have studied at Paris, and at some of the Italian universities. In 1518 we find him settled as a preacher at Dinkelsbühl, in Bavaria. In the end of that year he was invited to become preacher in the cathedral at Würzburg. He went to Würzburg in Feb. 1519, but his preaching was much too evangelical for the new bishop, and he had to leave, apparently in the beginning of 1520. Proceeding to Salzburg he preached for sometime in the cathedral, until the archbishop there also would not tolerate his pronounced opinions. He left Salzburg in the autumn of 1520, and went to Vienna, where he appears to have graduated D.D. at the University. He was already married (probably as early as 1519), and was one of the first priests who had dared to take this step. After a violent sermon against marriage, delivered by a monk in St. Peter's church, at Vienna, the governor of Lower Austria (Count Leonhard von Zech) asked Speratus to make a reply. With the consent of the bishop he did so, and preached, on Jan. 12, 1522, a sermon in the cathedral (St. Stephen's), founded on the Epistle for the 1st Sunday after the Epiphany, in which he expressed his opinions very freely regarding the monastic life and enforced celibacy, and also clearly set forth the doctrine of Justification by Faith. This sermon (published at Königsberg in 1524) made a great impression, and was condemned by the Theological Faculty at Vienna, who also prevented Speratus from accepting an invitation to become preacher at Ofen, near Vienna. On his way from Vienna to the north he stayed at Iglau in Moravia, where the abbot of the Dominican monastery appointed him as preacher. Here the people became greatly enamoured of him and of the Reformation doctrines,and stood firmly by him, notwithstanding the remonstrances and threats of the king, and of the bishop of Olmütz. In the summer of 1523 king Ludwig came to Olmütz and summoned Speratus to him. Without even the form of a trial he put him in prison, but after three months he released him, probably through the influence of his queen (Maria of Hungary), and of his cousin, the Margrave Albrecht of Brandenburg, but on the condition of his leaving Iglau and Moravia. In the end of 1523 Speratus came to Wittenberg, where he worked with Luther, and assisted him in the preparation of the first Lutheran hymn book (the Etlich cristlich lider. It contained 4 German hymns by Luther, 3 by Speratus, and 1 anonymous German hymn). 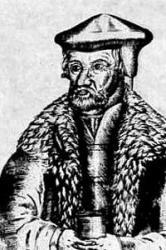 Luther then recommended him to the Margrave Albrecht, and about May 1524 the Margrave appointed him as court preacher at Königsberg. Here he had also charge of the Altstadt church till Graumann came into residence, in Oct. 1525. He seems to have had the principal share in drawing up the Liturgy and Canons (Kirchenordnung or "Book of Church Order") for the Prussian church, which was presented to the Diet in December 1525, and printed in 1526. On March 31, 1526, he was chosen as the clerical commissioner to visit the parishes of Prussia and see that the new arrangements were carried out; and in the end of 1529 he was appointed Lutheran bishop of Pomesania, with his residence at Marienwerder. Here he remained until his death on Aug. 12, 1551. Speratus was the author of various works, hut was best known as the Reformer of Prussia. Feeling that for the working of ordinary parishes it was necessary to have pastors who had been brought up in Prussia, and could preach, if need be, in Polish or Lettish, he gladly welcomed the foundation at Königsberg (1544) of the first Prussian university. Among other important events affecting his administration may be mentioned the Visitations of 1528, of 1538, and especially that which lasted from Dec. 15, 1542, to the middle of February 1543; the Synods of 1529 (the Synodical Constitutions were pub. in 1530), of 1530, and of 1531; the new Kirchenordnung of 1544; and the welcome he extended, in 1548, to the exiled Bohemian Brethren who settled iu Prussia. i. Es ist das Heil uns kommen her. Law and Gospel. This, his most famous hymn, is founded on Rom. iii. 28. It was probably written in the autumn of 1523, either during his imprisonment at Olmütz, or else during his stay at Wittenberg. Included as one of the 8 hymns in the Etlich cristlich lider1524, dated 1523, and entitled, “A hymn of Law and Faith, powerfully furnished with God's Word. Doctor Paul Speratus." Lauxmann, in Koch, viii. 236, calls it "the true confessional hymn of the Reformation, or, as Albert Knapp puts it, 'the poetical counterpart of Luther's preface to the Epistle to the Romans.'" He relates many instances of the effects it produced. It is a Scriptural ballad, setting forth, in what was, for the time, excellent verse, the characteristic teachings of the German Reformers; and is indeed of considerable historical importance. But for present day use it is too long, somewhat harsh in style, and too much a compend of doctrinal theology. (1) "Now is our health come from above." By Bishop Coverdale, 1539 (Remains. (2) "Our whole Salvation doth depend." By J. C. Jacobi, 1725, p. 23. (3) "Now comes salvation from above." By Dr. G. Walker, 1860, p. 79. (4) "Salva¬tion hath come down to us." By Miss Winkworth, 1869, p. 123.